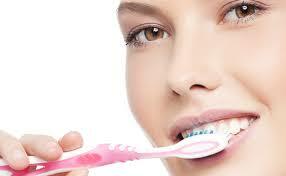 Cleaning the teeth and gums is an important part and an absolute necessity in our daily lives. Searching for the best oral care products that can both clean the teeth and gums and at the same time taste good can be quite difficult. We all have that experience of using an oral care product that we know that works great but we tend to suffer from its awful taste. We have been searching for a while for a tooth and gum powder that does its job by cleaning the mouth and getting rid of the bacteria and we found this Neem Tooth and Gum Powder. Is it really effective? Or is it just another oral care product that will only bring our hopes up and ends up letting us down? Hopefully, this review will give you the information that you need. Before you purchase this product, we will try to answer your questions and provide information that will help you have an informed decision whether Neem Tooth and Gum Powder is for you or not. 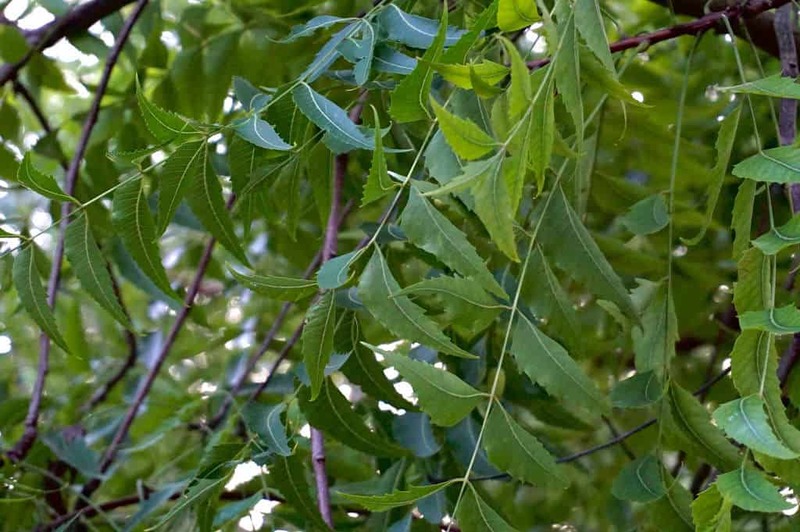 The Neem tree, also known as Azadirachta indica, has been used in India for thousands of years. It was commonly found in India, Pakistan, Bangladesh, Myanmar, and Sri Lanka but nowadays it is being grown in different parts of the world because of the benefits it gives. It is well-known for having lots of benefits and one of them is its great use in oral care. Neem twigs are used in Ancient India instead of a toothbrush to clean the teeth and helps prevent gum diseases and gingivitis. Neem is effective in killing bacteria and reduce plaque formation in the mouth. There are researches done regarding Neem which shows that when it is used 2x a day for 6 weeks there is a significant effect on reducing the amount of plaque formation in the teeth. This herb is useful for different ailments, it has antibacterial and anti-inflammatory properties that make it useful for oral care health. Neem is known for killing bacteria in the mouth that can cause cavities and other gum diseases. Using neem mouth rinses reduces plaque and if combined with brushing the teeth regularly, it will help clean the mouth and get rid of plaque in no time. What is Neem Tooth and Gum Powder? Neem Tooth and Gum Powder is created by Organix South Inc. It is created with potent CO2 extracts that increase the tooth powder’s therapeutic actions that lead to a clean and bright smile. This oral care product contains Neem leaf and Neem bark. It also contains Xylitol, Vitamin D3, and Probiotics for the improvement of overall oral health. It effectively cleans the mouth from bacteria and prevents plaque and tartar build up. Say good bye to cavities and gum diseases! buy getting your powder Now. How Does Neem Tooth and Gum Powder Work? Neem tooth and gum powder is beneficial in preventing dental problems. It helps to fight bacteria that can cause gum diseases and make your mouth free from bacteria and it prevents plaque and improves oral health by preventing cavities. It is safe to use and will help improve your oral health. What ingredients are in Neem Tooth and Gum Powder? Xylitol – A sugar substitute. Sodium Bicarbonate – Has a plaque removal effect. Supercritical Extracts of Peppermint Leaf – helps prevent gum diseases like gingivitis. Spearmint Leaf – Has antimicrobial effects and helps improve oral health. Neem Leaf – Antibacterial properties that fight off bacteria in the mouth. Neem Bark – Antibacterial and anti-inflammatory properties that prevent the build-up of plaque, tartar and prevent the formation of cavities and gum diseases. Anise Fruit – Sweet and Aromatic. Clove Bud – Contains Eugenol that is effective in managing toothache. Sodium Methyl Cocoyl Taurate – Safe to use for cosmetic products and acts as a foaming agent. Maltodextrin – Thickening agent, serves as a food additive. It is also used as a sugar substitute and a dietary supplement by athletes. Calcium Carbonate – Strengthens and cleans the teeth. A small amount of calcium can help remineralize teeth. Sea Salt – Soothes painful toothache and fight bacterial infections. Silica – Helps build and protect your teeth. Stevia Rebaudiana Leaf Extract – Serves as a sweetener. Streptococcus Salivarius K12 (probiotics) – Probiotic in the oral cavity. It helps manage problems like oral inflammation and gum diseases. Cholecalciferol (Vitamin D-3) Powder – Helps in the development of bones and teeth. 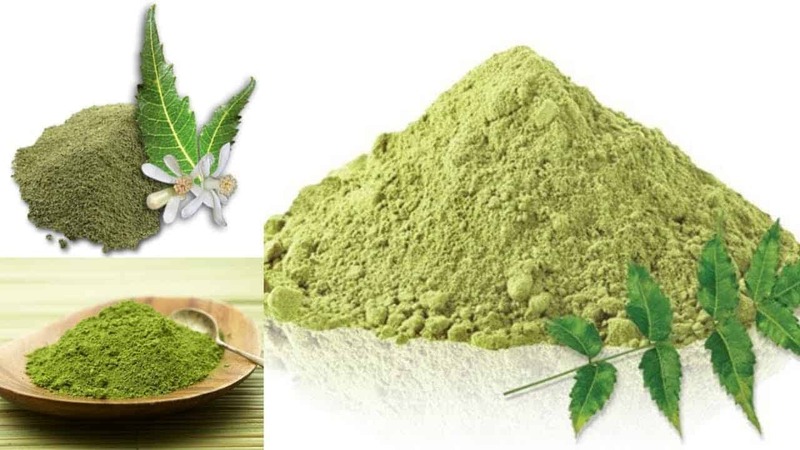 How to use Neem Tooth and Gum Powder? The website’s directions are tap the powder into your toothbrush then brush your teeth with it. There is a possibility that you may drop the container and waste all the powder inside it. Dip your damp toothbrush at a container that contains the tooth powder so you can save it and it will last for a long time. Brush your teeth by using the tooth and gum powder just like how you use a toothpaste normally and you can do this at least twice a day to have clean teeth and healthy gums. It does not whiten teeth. It cannot remove teeth stains. It comes in two flavors, Mint and Cinnamon. If you are not a fan of the cinnamon taste, it leaves an awful taste in the mouth. I advise that you stay away from it. The mint flavor is not long lasting especially if you want mint smelling fresh breath. Cleans the teeth and gums, it makes your mouth free from bacteria and reduces the possibility of teeth and gum diseases. It contains Probiotics and Vitamin D3. Fights the bacteria to prevent the build-up of plaque and tartar that can cause cavities and bad breath. It does not contain Fluoride, Paraben, Sulfates and Gluten. It is a cruelty-free product because it is not tested on animals. How Much Does The Neem Tooth and Gum Powder Cost? The Neem Tooth and Gum Powder is available for purchase on the Amazon website. The listed price is $17.83 and it comes with free shipping with Amazon Prime. You will be able to get two bottles which make it reasonably cheaper than buying one bottle which costs around $9.29. You get to save your money and at the same time clean your teeth and gums and get rid of the bad bacteria that can cause teeth and gum problems. The Neem Tooth and Gum Powder has a rating of 3.7 out of 5 stars on Amazon. Where Can I Buy Neem Tooth and Gum Powder? You can purchase Neem Tooth and Gum Powder on Amazon. It comes in two different flavors, Mint and Cinnamon. You can try both flavors and choose which one you prefer best depending on your personal preference. 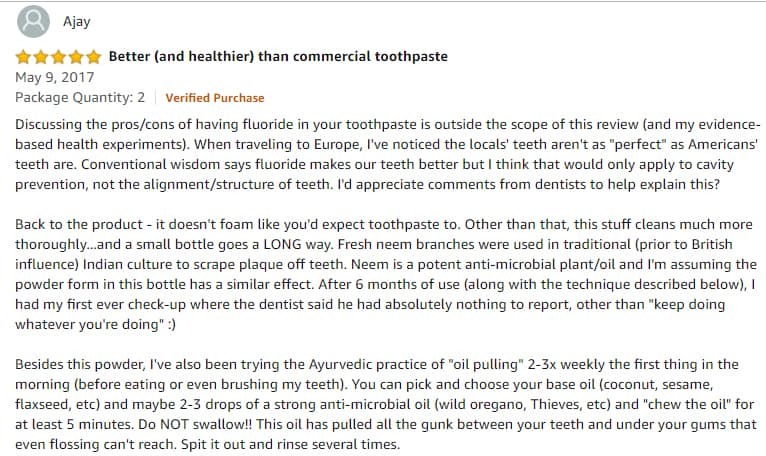 We love buying the Neem Tooth and Gum Powder on Amazon because it is a well-known website and it gives us assurance that we are buying legit products from them. As we all know there are lots of websites that also sell different oral care products and there is a possibility that you are buying a real and legit product. 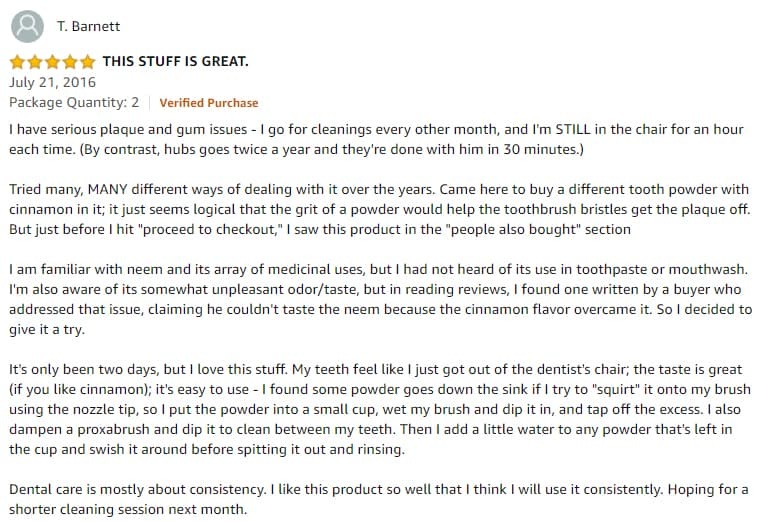 You can check out the different customer reviews of Neem Tooth and Gum Powder on Amazon ($17.83). Q: Is it safe to use? Does it contain Fluoride and other harmful chemicals? A: It does not contain Fluoride, Sulfides, Parabens, and Gluten Free. A: The powder comes in a 40 grams bottle and it can last up to 200 brushings. Q: Is the Neem Tooth and Gum Powder effective for the remineralizing of your teeth? A: No it is not. This tooth powder is useful for cleaning your teeth and gums and getting rid of the bacteria that can cause gum diseases and cavities. Q: What is the importance of including probiotics in the ingredients of the Neem Tooth and Gum Powder? A: By adding probiotics (good bacteria) to the Neem Tooth and Gum Powder, it helps with holistic oral health care as well as the whole body as it fights the bad bacteria in the mouth. Q: Does it help whiten the teeth? A: If you have darker stains, you are better off with teeth whiteners. There are whitening strips and whitening toothpaste available in the market. If you are only after cleaning and maintaining healthy teeth and gums, this product is worth trying out. The Neem Tooth and Gum powder is an amazing oral care product that incorporated Neem leaf, Neem bark and along with other natural products. It is able to clean your teeth and gums and it contains Vitamin D3 and Probiotics that help improve your oral health as well as fight bacteria that may lead to gum diseases and cavities. Neem tooth and gum powder is created by Organix South Inc. You can clean your teeth and gums and at the same time take part in taking care of the planet. It is in powder form so you can keep it in a small container when you are travelling. You can make your pearly whites clean. This cruelty-free product helps you keep your teeth and gums clean and at the same time help you save Mother Earth from all the harsh and harmful chemicals that are commonly found in other cosmetic products. It is safe to use and does not contain fluoride, sulfates, parabens, and gluten. Fluoride has been proven to be one of the most toxic substances just like Lead and Arsenic. It comes in two different flavors, Cinnamon and Mint. You just use it as you use your toothpaste by brushing your teeth regularly, at least 2x a day. 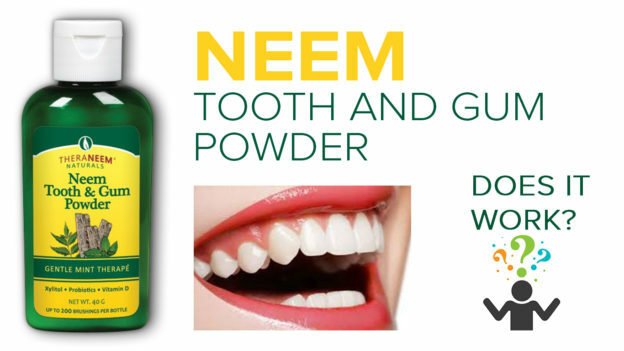 If you want a healthy looking and beautiful smile you can try out Neem Tree Tooth and Gum Powder now. If you are still undecided, I hope this information will convince you by knowing that it is the Winner of Best Natural Personal Care Product at ExpoWest 2012! 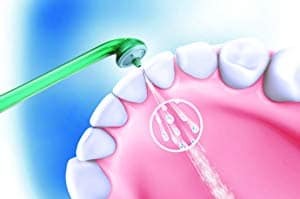 Water flossers are not a particularly new phenomenon but they have been gaining massive popularity over the last few years and some research papers have found they are more effective at removing plaque and food debris stuck in between teeth than your normal string floss. But is there really any point in investing in a tool that will give you slight benefits? 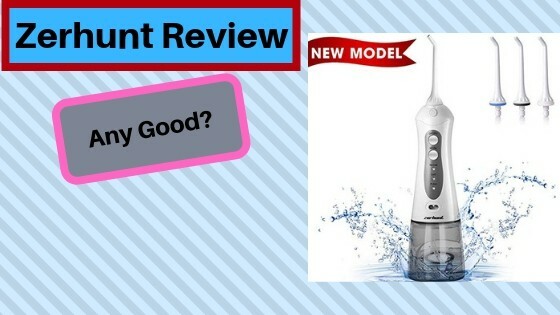 Well in this Zerhunt Water Flosser Review we will give you all the details you need to make an informed decision if it’s actually worth your time. What is Zerhunt Water Flosser? It’s an electric based flosser which pushes out water from the tip at high pressure so it can dislodge plaque and food particles that are stuck in between teeth. It’s actually quite convenient and easier to use than let’s say regular floss which can be quite cumbersome at the best of times. The Company has actually updated the Zerhunt flosser as per customer request. This means the water tank holds up to 300ml which is up from 200ml they had last year and they have a big discount at the moment so if you want to take advantage of that please head on over to Amazon Now to Save 46%. Another great thing about this particular water flosser is that it’s cordless and waterproof which means there is no risk of getting it damaged or being electrocuted whilst using it. It’s also made by a reputable company which specialise in advanced technology to make it easier for us common people to use (don’t be insulted by the word common). Not everyone can handle the same pressure that is released by the Zerhunt which is why they have created a setting for everyone. Normal Mode will blast 100psi of water into your mouth and be the most powerful setting available. Soft Mode is the lightest mode that can be used to clean teeth. We recommend using this mode if it’s your first time experiencing a water flosser. 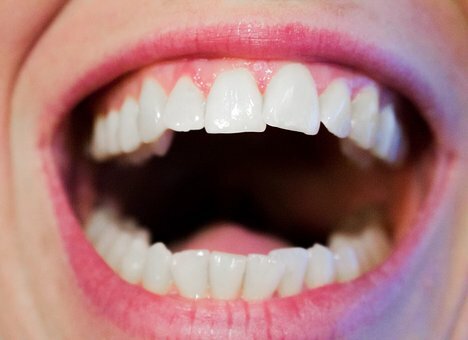 Pulse Mode is where short blasts of water are ejected into the gums giving them a massage. You can expect around 1700 pulses per minute with this particular model which is more than enough to get the job done. One thing with water flossers is they can be quite hard to carry around with you on your travels, especially if you look at the Waterpik flossers. But the Zerhunt flosser is lightweight and compact making it easy to carry with you. It also has 110 – 240V universal voltage which means you can charge it anywhere in the world, just make sure you have the right power adaptor for the country you are going to. Once fully charged you are able to use the water flosser for up to 14 days without interruptions and this is largely thanks to the premium lithium battery of 1400mAh. It may seem quite big initially but once you pick it up, it’s surprisingly light which makes sense because you don’t want to be carrying something that weighs a ton when on holiday or business trip. Even kids find it easy to use!. 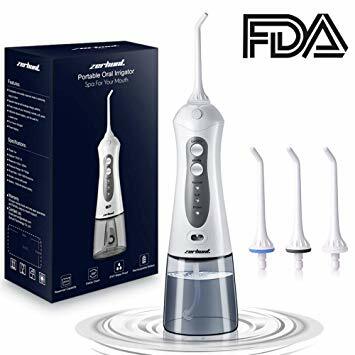 One of the great things is you get 3 Oral irrigator jet tips with this flosser so if anything goes wrong with the first one, you always have a backup to rely on or if you wanted you could share it with your partner. Judging by the reviews left, it’s a powerful little machine and the amount of water pressure it releases is not really suitable for children under 13 years of age. Never let kids use it on their own, always supervise them until they know all the features and are comfortable with it. People who have unsteady hands might also find it quite hard to use because the water stream ejected needs to be aimed properly, any nervousness might cause a mess around the bathroom, trust me!. It’s also worth mentioning that these types of flossing devices can take some time getting use to. For some people it took 1 full week before they felt they had mastered the device. For others, it might take only a couple of days. What I’m trying to say is please be patient and persistent and you will see results. If you have Small Hands you might struggle to grip it properly because the base of the flosser is quite girthy and some people have said their fingers end up on the bottom part of the device and this causes them to press the different setting buttons which makes the whole thing out of whack. One other thing that surprises people is the vicious blast of water that ejects from the nozzle, they simply aren’t prepared for it. It’s not really a drawback as such but you need to be wary that it packs a punch so be careful when using it for the first time. There are some negatives but these are over shadowed by the good things about the Zerhunt, first off the portability factor is massive and it’s why so many people have brought it. 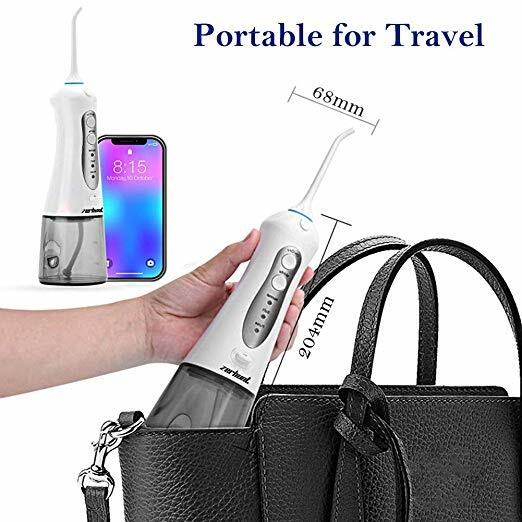 The travel case is an added bonus and it makes it easier for you to take the water flosser anywhere you want. Another great thing about it is that unlike the more popular brand: waterpik, this flosser is cordless meaning you can have more flexibility when trying to maneuver it around. The Price might be the biggest positive because at the moment it’s been reduced to $37.95 from $69.99. That’s a big saving of 46% but as we know with amazon, they like changing the prices regularly so who know when it will go back up to the higher end. On Amazon it’s been reviewed by over 340 customers and the average star rating is 4.1 Out of 5. This makes it a solid product. The general consensus is that it worked really well and was relatively easy to use. Being cordless and portable also struck a cord with everyone because it just makes it easier to use and it’s less mess. Another thing that is mentioned was the power output of this device which surprised some people. They weren’t ‘t expecting a powerful jet blast when they turned it on, but this tells us that the product is doing it’s job. There were however some critical reviews which stated that the device stopped working after a couple of months due to a power failure of some sort. 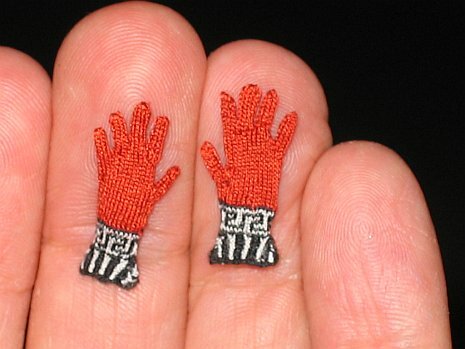 It’s quite possible that there will be some faulty items but you can always talk to the manufacturers and get a replacement sent. Where To Buy The Zerhunt Water Flosser? This water flosser is currently being advertised on Amazon as is everything nowadays but that’s a good thing because you automatically get a 30-day money back guarantee if the product is not to your liking. It’s all pretty safe and no fraudulent activity is likely to take place. The Zerhunt water flosser is currently on offer because they have released the new updated version. It’s currently priced at $37.95 down from $69.99. That’s a saving of $32.04! If your interested in enhancing your flossing routine then go and take advantage of the discounted Zerhunt Water Flosser. So there you have it, in this Zerhunt Water Flosser Review we have covered all the important information you need to make an informed decision on whether it’s the right fit for you. First of all the Compactness and portability factor stick out like a sore thumb. It’s one of the main reasons people love it so much because you can take it anywhere you want. It’s also very powerful with 1700 pulsations per minute and a pressure of between 30 – 100psi, you are sure to get a thorough clean. Yes there are other water flossers on the market which might do a better job or be more easy to handle but for the price that you pay here, you are absolutely getting the biggest bang for your buck. Remember, if your not happy with it there is also a 30-day money back guarantee for that extra piece of mind. Q. Is this Water Flosser good with Braces? Q. How noisy is this water flosser? Q. It comes with 2 power adaptors, a squarish one and a larger, flatter one. Which one to use? A. One is a USB port charger and one is for the electrical outlet. Visiting dentists are something that a lot of us dread from doing but we must at least do this once a year or every 6 months. 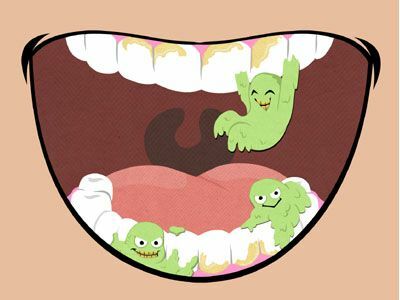 Once you learned that you have cavities, don’t worry it is not the end of the world! It is not too late for your tooth; in fact, according to our research getting cavities doesn’t mean you have to fix it up using fillings. 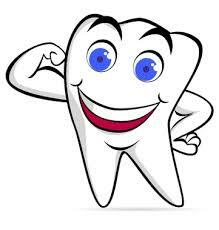 We have learned that our tooth is naturally capable of fixing itself. If you have found out that you have a tooth cavity, please read on below so you will know How to Heal a Cavity without fillings. We will teach you different solutions you can do so your teeth can be fixed without having the need of going to the dentist to have your teeth fixed by synthetic fillings. The teeth have 4 different components. If you want to fully understand the tooth’s natural ability to rebuild it, you have to understand and know the 4 different components of the teeth. 1. 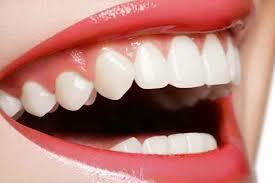 Enamel – The enamel is the component that covers the tooth. It is created by ameloblasts. It is the hardest substance in the body and it is the part of the tooth that is considered as the first line of protection from cavities and tooth decay. The enamel is the part of the tooth that is not able to regrow itself once it is fully formed. If there are instances that demineralization occurs on the tooth, there are different ways to remineralize or harden it and therefore stopping the process of decay. Proper nutrition intake and excellent oral care are important and will help remineralize it. The enamel has a translucent color. 2. Dentin – The dentin is the component of the tooth in between the enamel and the cementum. It is created by the odontoblasts and it makes up the larger portion of the tooth. The dentin is composed of dentinal tubules and there are three types of dentin. Primary dentin is the one that is present when the tooth erupts. The secondary dentin is formed continuously during the tooth’s life. Reparative dentin is the type of dentin that may form when a trauma, inflammation or irritation occurs. The dentin is the one responsible for the color of the tooth. The dentin is softer than the enamel of the tooth. When the cavities pass through the enamel and it reaches the dentin, there is a great possibility that it can spread easily from here. The dentin and the enamel meet at the dentoenamel junction of the teeth. 3. Cementum – The cementum is the component of the tooth that encapsulates the root part of the tooth. It is thin and not as hard as the enamel but it is somewhat similar to the hardness of the bone. The cementum is formed by the cementoblasts. The cementum has fibers that are attached to the alveolar bone. The cementum is the part of the tooth that is prone to the stiff bristles of a toothbrush. When your cementum is exposed to the oral cavity because of the recession of the gums, this is the area that is prone to hot and cold temperature changes in the mouth. The enamel and the cementum meet at the cementoenamel junction. 4. Pulp – The pulp is the last component of the tooth. This is the part that is constituted by nerves, blood vessels that provide blood circulation for the teeth. The pulp is divided into two sections. The pulp chamber where it is located in the tooth crown and the pulp canals where it is located in the roots of the tooth. Once the pulp area is exposed to cavities and decay, a bacterial infection can occur and therefore require root canal therapy to save the tooth. 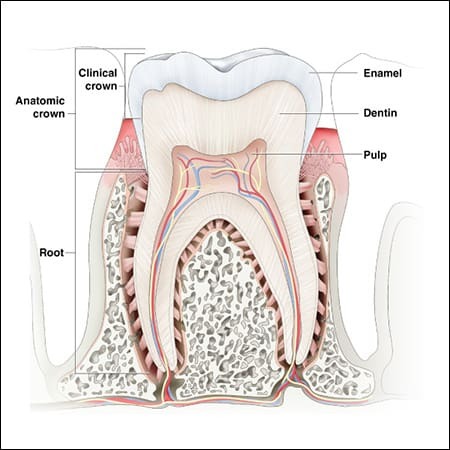 During the first eruption of the tooth, the pulp chamber and canals are quite large when the secondary dentin forms the pulp decreases in size. 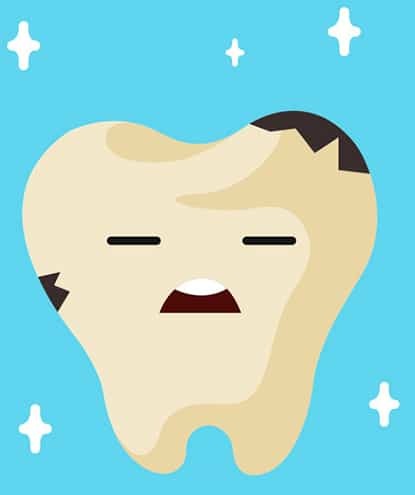 Cavities or hole of the tooth can occur when the tooth experiences decay. It occurs when the enamel of the tooth softens and there is damage in the tooth structure. 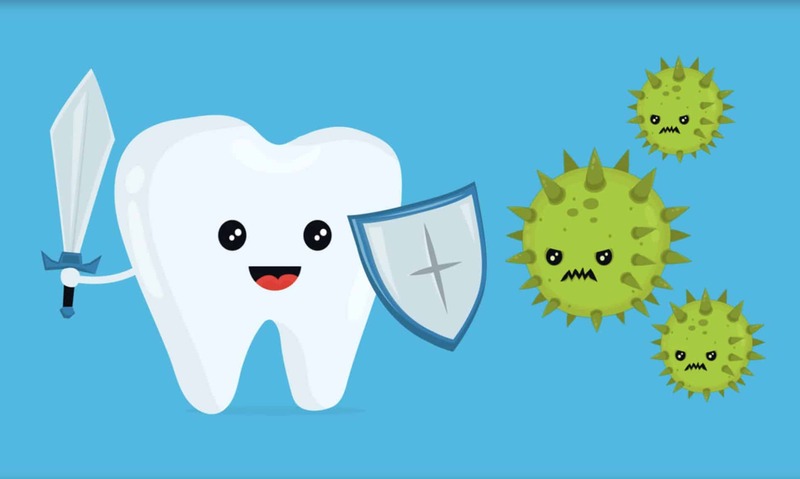 The plaque bacteria break down the sugar in the mouth and it results in producing acids that can cause damage on your tooth. If the mineral loss of the enamel is not treated as soon as possible the holes on the teeth can grow and can possibly destroy the whole tooth. The plaque bacteria can also damage the dentin and may eventually cause a root cavity. When this occurs, the nerves are exposed and it will be evident with the pain you feel every time you eat or drink hot or cold foods. If there is a pain at the root part of your tooth, there is a possibility that you have tooth decay and you must consult your dentist as soon as possible. The symptoms of a cavity depend on the severity of tooth decay or dental caries. There are different causes of cavities and here are some of them. Eating sugary foods and beverages – If you have a sweet tooth, there is a possibility that you consume more sugar daily, the more sugar you eat, the more acid is produced that can cause the decay of the tooth. Tooth decay can also occur from eating too many carbohydrates that may be trapped in between the teeth and not completely removed by normal brushing and flossing. Poor oral hygiene – If you are a person who hates brushing your teeth, we have news for you, not brushing the teeth is one of the major causes of having tooth decay and cavities. This allows the plaque to build up on your teeth and attack the enamel of your tooth. Plaque – The plaque formation on the different areas of your teeth that does not get cleaned properly can be a cause of tooth decay. Plaque is caused by bacteria, saliva, acid, food stuck in your teeth are all combined inside the mouth. When the plaque adheres on your teeth it builds up over time especially if you do not brush and floss regularly. The acid causes the enamel of your teeth to soften and often results in holes on your teeth or as we all know it as cavities. Dry Mouth – Saliva has an important role in our mouth. It helps to wash the plaque in your mouth. If you have a dry mouth, you are prone to increased plaque buildup than individuals who do not have dry mouth. Eating and Drinking – This is unavoidable as we all need to eat and drink to live, however, this is one of the main causes of the formation of cavities. Whenever we eat or drink the carbohydrates from the food or drink stays on the teeth until we brush and floss our teeth. If there are particles that are not completely removed even after brushing and flossing the teeth, these are the culprit that hastens the possibility of having a tooth cavity. 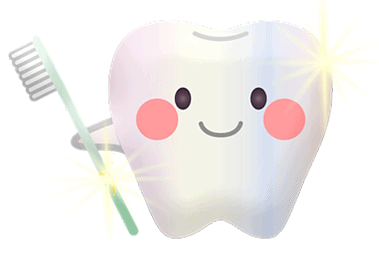 By being able to brush and floss regularly especially after drinking sweet drinks and milk, eating candies, chocolates and even breath mints, yes you read it right! Even breath mints can cause tooth cavities! 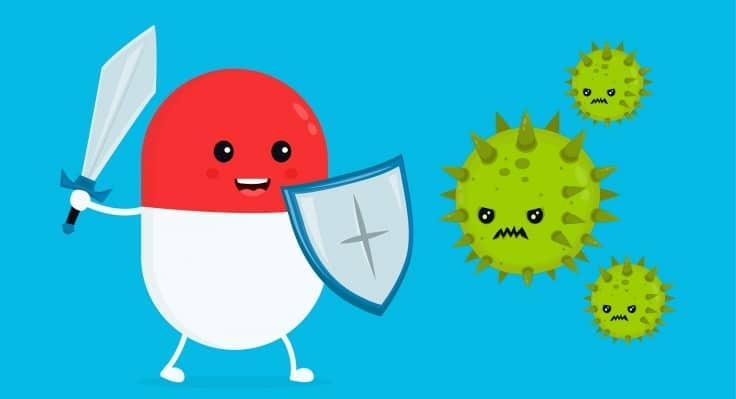 Bacteria – Bacteria are commonly found in the mouth. Yes, that is right! Whether we like it or not, we all have bacteria normally living in our mouth. When these bacteria feed on the carbohydrates from the food and drink you consumed it results in acid formation which causes tooth decay. 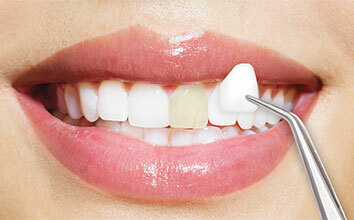 Medical problems and health issues – There are medical issues that can increase the possibility of a tooth cavity. Individuals who have Bulimia have a higher risk of having tooth cavities when the teeth are repeatedly exposed to acid coming from the stomach due to frequent vomiting. Cancer patients are prone especially when they undergo radiation on the head and neck, therefore, changing the saliva that increases bacterial growth in the mouth. You must take good care of your teeth, it is an important part of your overall health and by doing this you are preventing the formation of cavities on your teeth. Dental caries are one of the causes of tooth decay and it can be a sign of poor maintenance of oral health and proper hygiene. Brushing and flossing are not enough to reverse the cavities that already formed in your teeth but they are also essential factors that need to be properly done if you want your teeth to heal from the cavities. When a dentist finds a cavity and depending on the severity of the decay, he or she will suggest to drill out the decay and fill the hole with a synthetic material. 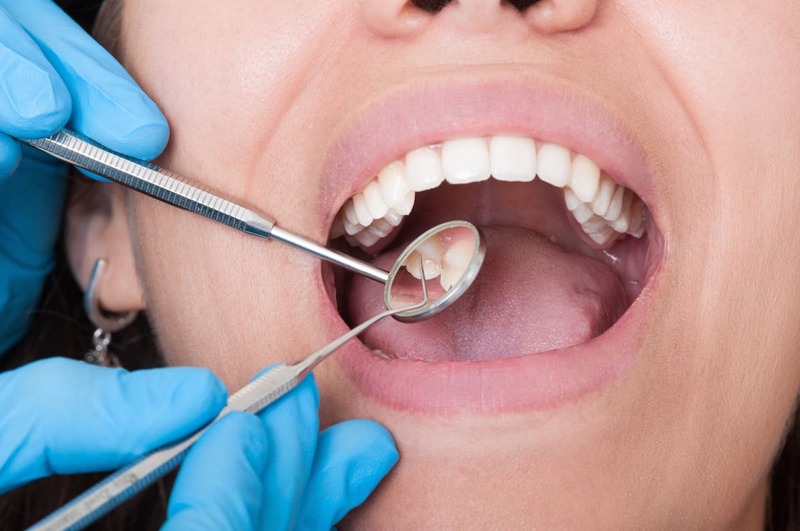 Other times, the dentist will suggest giving you a crown, a custom fitted on the healthy portion of the tooth and drills out the decayed part accordingly. When the cavities have reached the pulp of the tooth, a root canal may be necessary. This procedure is done by drilling and removing the decayed pulp and administering medication to heal the infection, then the decayed part will be replaced by a filling. When the tooth is severely affected, the dentist will have to extract the decayed tooth and a false tooth can be put in place of the removed tooth. Change your eating habits – We all have been guilty at some point in time. Who doesn’t love eating sweets and drinking soda? Based on our research we have learned that eating and drinking too many sweets is not good for your health but as well as your oral health. 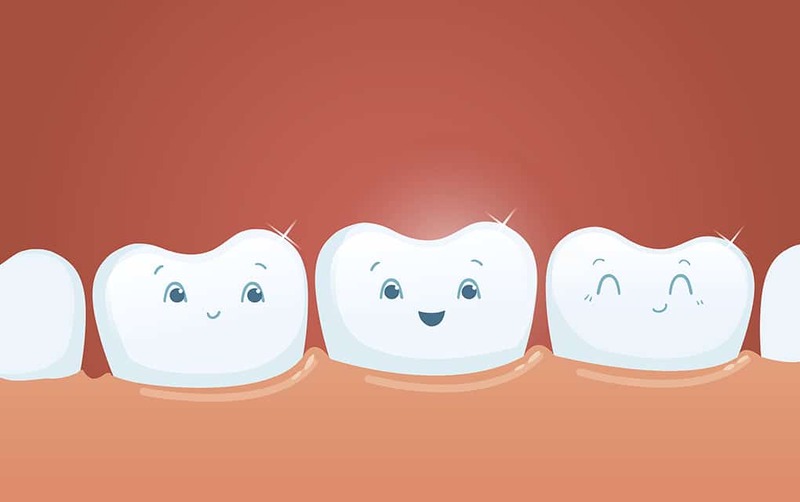 Bacteria love sugar and the more sugar you feed them, the more acids are produced that hastens the production of plaque and results in cavities in no time. Eat healthy foods – Healthy foods that are rich in calcium like raw milk are known for helping a tooth cavity repair itself. 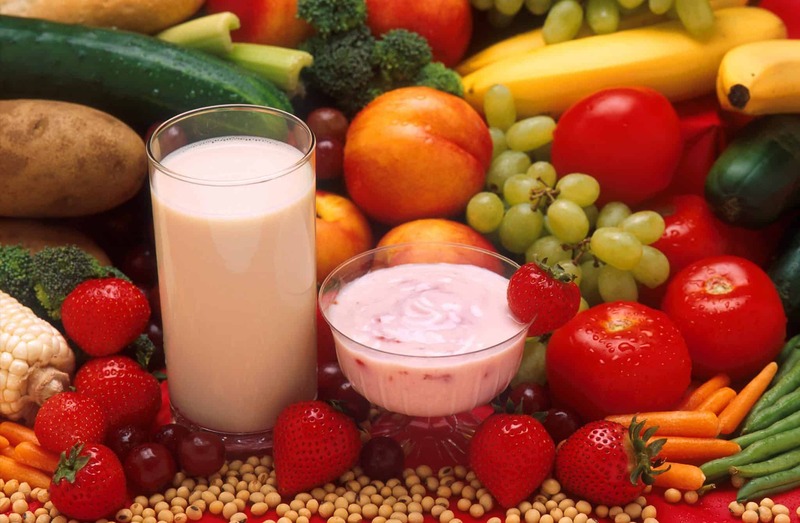 Calcium-rich foods are rich in calcium, the main component of teeth and bones. 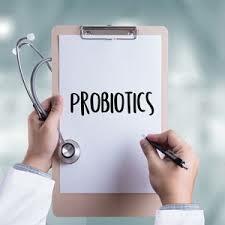 Foods rich in probiotics are helpful in increasing the production of healthy bacteria in the mouth. 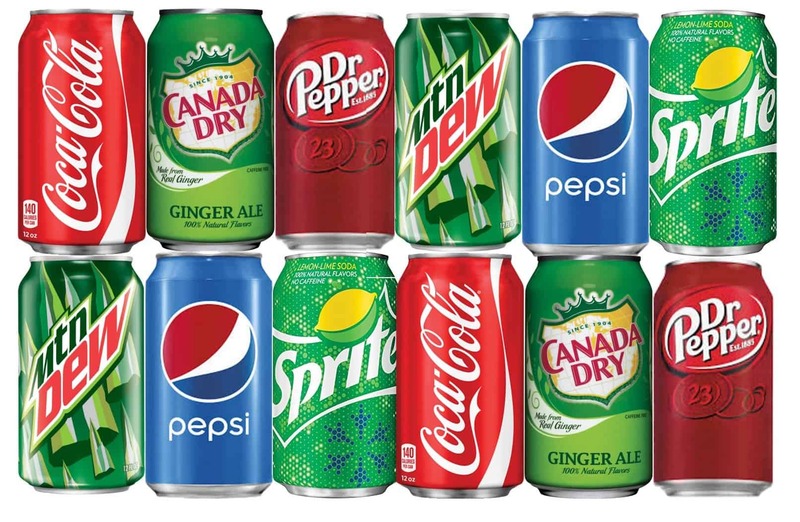 Drink unsweetened beverages – If you love drinking soda, juices, and other sweetened beverages, it is time for you to consider drinking unsweetened ones. 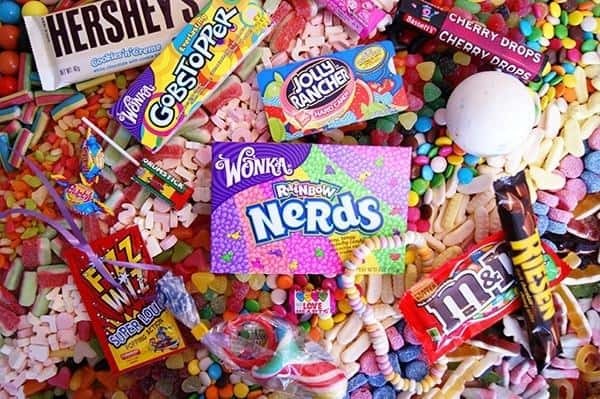 Sugar is one of the causes of cavities. 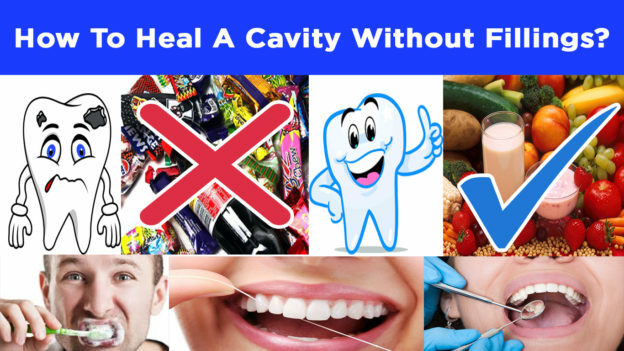 If you want to help your tooth naturally heal from cavities, you have to do everything that you can. Make sure to increase water intake as it helps to hydrate the body and increase saliva production and prevent the mouth from getting dry. Change your toothbrush regularly – Use a small or medium-sized toothbrush that has soft bristles so it can reach the hard to reach areas of the teeth. Do not use a toothbrush cover and always clean it with water and air dry after using it. Observe proper dental cleaning – Brush your teeth at least twice a day and floss your teeth especially in between areas of the teeth at least once a day. Use alcohol-free mouth wash to clean your mouth and freshen your breath. Visit the dentist regularly – Visiting the dentist may not be a pleasant experience but we all know that regular teeth cleanings are a must for our teeth to stay cavities free. Make sure to visit your dentist at least once or twice a year. Take vitamins – Supplements and vitamins help improve your oral health. Increased salivation helps prevent plaque and tartar build-up. Fruits, vegetables, and nuts like apples, bananas, and peas are a must in your daily diet. Whole grain foods are rich in vitamin B and seafood are rich in Vitamin D. Vitamin K has been found to be essential for healthy teeth. 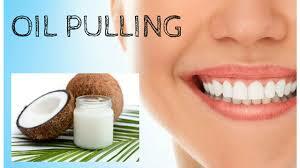 Use Coconut oil – Coconut oil can naturally protect your teeth from getting cavities. It helps to pull the bacteria from the teeth and it helps heal it naturally. You can do this by taking 1 tbsp of coconut oil in your mouth for 20 minutes until the saliva and oil turn into a milky white color. Do not swallow the oil and rinse it afterward. Do it yourself remineralizing toothpaste – Use the following ingredients below. If you make this remineralizing toothpaste, you are sure that you are using toothpaste that is made from natural ingredients and does not contain harsh chemicals that can be harmful to your health. Mix all the ingredients until you have it as a paste form. This toothpaste is not advisable to use for more than 30 days due to its abrasive structure. Take note of the pH of the foods that you consume – If there is an imbalanced pH level, it allows the growth of bacteria. Drinking too much coffee creates pH imbalances and can be a conducive environment for the growth of the infectious bacteria in the mouth. Green tea is the perfect alternative drink as it contains polyphenol, a powerful antioxidant and has anti-inflammatory properties that are effective in preventing the growth of bad bacteria and results in improved oral health. Supplements that support remineralization – You can take supplements like Magnesium, Phosphorus, Vitamin D3, Vitamin K2, and Collagen. Check for hormone imbalances – Sometimes when the hormones are imbalanced, it can also cause tooth decay. Do not over brush your teeth – Your teeth must not be brushed using hard bristles and brushing too hard can cause harm than good. Make sure you are brushing to remove the particles and plaque but at the same time not too hard that it may harm the enamel of your teeth. You can also brush using your opposite hand with gentle and circular motion to remove the food particles and clean your teeth effectively. Preventing cavities is better than looking for ways to heal them. Always make sure to follow these tips that we have compiled for you so you can avoid having a cavity or dental caries. A trip to the dentist is a must at least once a year. Pay attention and take care of your pearly whites by using a soft-bristled toothbrush, you can use a remineralization toothpaste and make sure to consult your dentist if it is possible instead of healing your cavity by using synthetic fillings. Cleaning your teeth by brushing is not just enough, we all know and we have been informed by our dentist that we need to floss as much as we brush our teeth every time we visit the dentist office. If the idea of flossing makes you sigh every time, there is a possibility that you do not do it regularly. Food that is stuck in between the teeth and the hard to reach areas that are barely reached when brushing normally can cause the increase of bacteria in your mouth making you prone to teeth and gum diseases as well as plaque and bad breath. Cleaning the teeth is not an easy chore and it is not enjoyable for anyone but we all know that it is a must and an important part of our daily regimen. 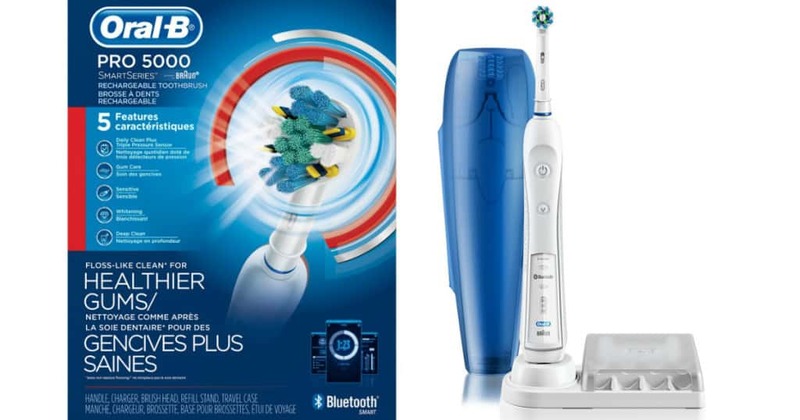 In this Philips Sonicare Airfloss review, we will reveal to you if it is worth buying or not. Are you better off with manual flossing? Is this product effective in removing food particles in between the teeth? There are lots of questions that come to mind and we know it is quite important to know all the details before you decide to purchase this product, as a matter of fact, any product to be exact. 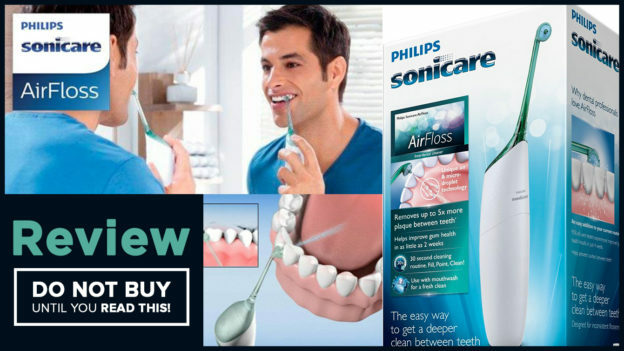 Before purchasing Philips Sonicare Airfloss, we recommend you to read through this review so you will have an informed decision whether it is for you or not. What is Philips Sonicare Airfloss? 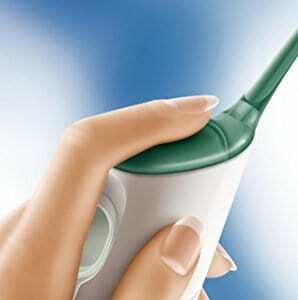 Philips Sonicare Airfloss is created by Philips, a well-known company for producing electric toothbrushes. By using the Airfloss, you can carefully and safely remove the plaque and food particles stuck in between the teeth and it can now be done. 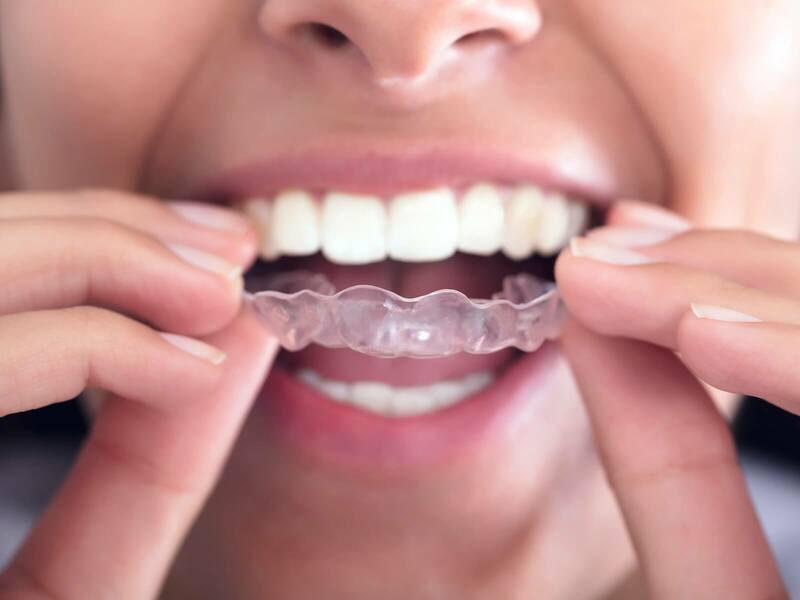 It is equipped with advanced technology that uses a burst of air and droplets of water or mouthwash which removes the plaque in between the teeth. Why is dental flossing important? Cleaning the teeth is not as simple as just brushing it 2-3x daily. You must also floss, the normal bristles of a toothbrush cannot reach and clean the plaque stuck between the teeth and gum line. That’s why our dentists recommend flossing all the time, especially whenever we visit them. Cavities and gum diseases usually start in between the teeth and if you are not flossing your teeth, approximately 40% of your teeth are not being cleaned. 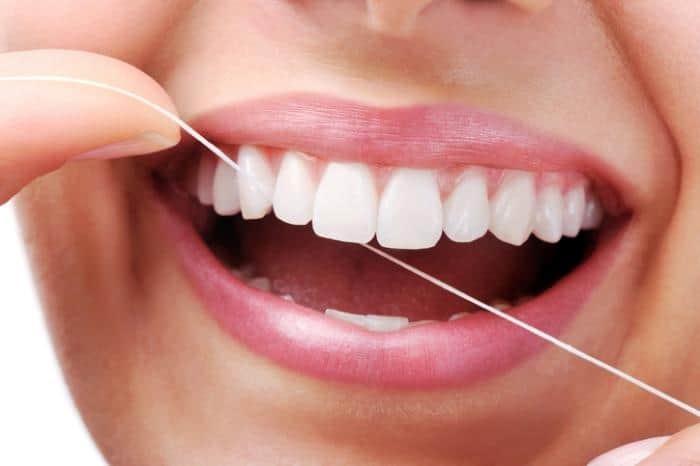 Dental flossing is an important aspect of oral healthcare and without it, the plaque, bacteria, and food particles will be stuck in your teeth and gums which may result in tartar, cavities, and periodontal diseases. If you are guilty of not flossing after brushing your teeth, don’t worry we are not here to judge you. In fact, we are here to give you more information regarding its benefits. Flossing at least once a day helps remove the food particles and prevents the plaque build up on your teeth and help eliminate bad breath problems. Cleans your teeth and makes it look brighter and free from cavities. It also reduces the risk of teeth and gum disease. If you value your oral health just like we do, we advise you to floss at least once a day. Keep your gums and teeth happy and healthy and use Philips Sonicare Airfloss. How Does Philips Sonicare Airfloss Work? In just 30 seconds, Airfloss delivers a quick cleaning of your mouth and teeth, keeping it free from food particles and plaque that can cause cavities and tartar. The auto-burst function makes you release bursts of air and droplets that provides fast and effective cleaning routine. The strong enough pressure from the Airfloss effectively removes the plaque in between your teeth that can cause tartar and cavities. Anyone can use Philips Sonicare Airfloss, it is safe, easy to use and gentle on both teeth and gums. Individuals who have braces, implants, and veneers can safely use it with no worries at all. Make sure to replace the nozzle every 6 months so you can be sure that it works effectively in flossing your pearly whites. How to Use Philips Sonicare Airfloss? Philips Sonicare Airfloss uses compressed air that helps facilitate the droplets of water or mouthwash. Press the power button to turn on the Philips Sonicare AirFloss. 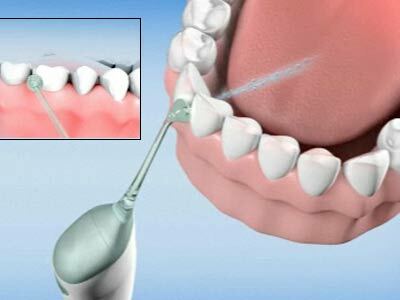 Gently place the nozzle tip of the AirFloss between the teeth just right at the gum line. Make sure to close your lips before you start flossing to minimize the splashing of the liquid. By pressing the activation button it will deliver bursts a combination of air and droplets of water or mouthwash between the teeth. Slightly move the nozzle tip on the gum line to reach the next teeth, continue the process until you clean the hard to reach areas of your teeth. Press the power button to turn it off after you are done flossing your teeth. Important Note: The Philips Sonicare Airfloss will turn off automatically if it is not in use for more than a minute. 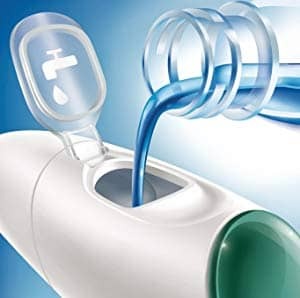 You can use the Philips Sonicare Airfloss by filling the reservoir with water or mouthwash. It can be used with water and mouth wash which results in a fresh and clean mouth after every use. You have the option to use water, mouthwash or a combination of both. 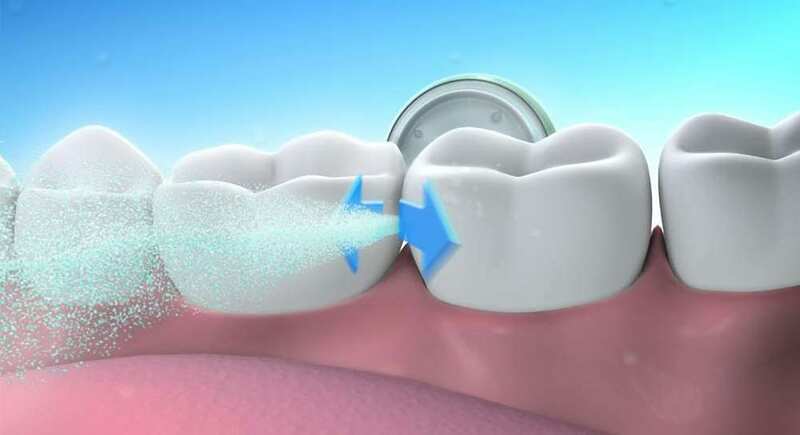 Just point the guidance tip and clean your teeth for just 30 seconds and afterward, you can feel that your mouth is clean and free from the food particles stuck in between the teeth and even those hard to reach areas in your mouth. Before using it, make sure you charge the Philips Sonicare Airfloss for at least 24 hours so you are guaranteed that the battery is full and will work whenever you use it for 3 weeks. You can press the power button to reach a specific or desired mode. You can base it by the burst of the LED light. We recommend you to use the Triple burst mode as it is the most effective and will produce the best results in cleaning your teeth and gums. What I Like About Philips Sonicare Airfloss? Gentle to your gums and teeth and improves gum health if used regularly and it is easy to use. It prevents cavities and tartar in between the teeth and hard to reach areas. Compared to using toothbrushes, Philips Sonicare Airfloss is able to remove almost 5x more plaque between the teeth. It takes up less space and the battery life works up to 3 weeks when it is fully charged. Water resistant and it is cordless and no hose attached to it making it safe to use inside the bathroom. It also uses a small amount of liquid every time and guaranteed to create a small mess. What I Don’t Like About Philips Sonicare Airfloss? Has a higher price compared to the Waterpik models. 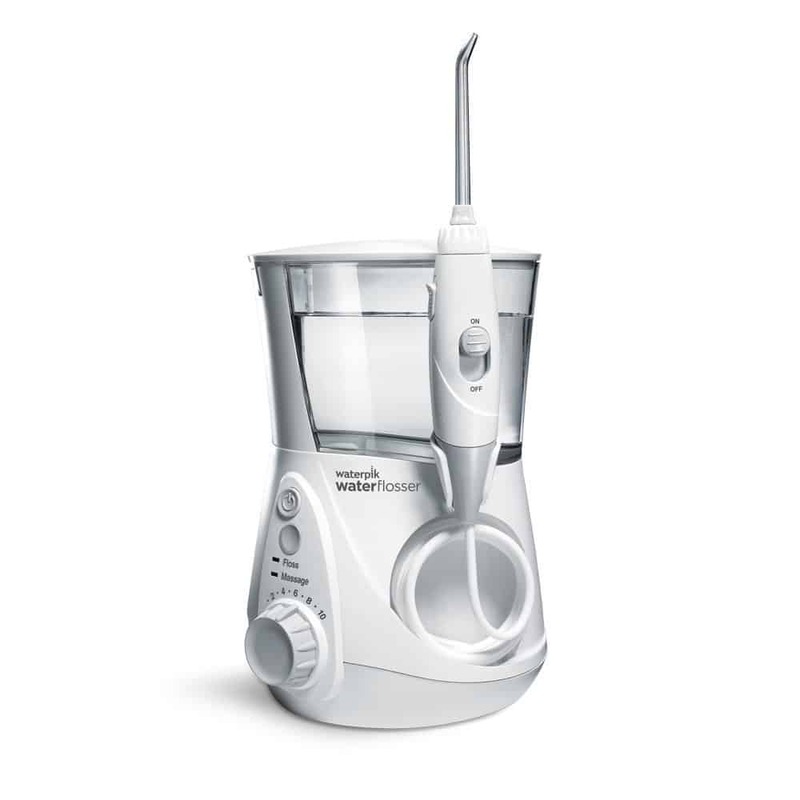 Some reviews mention that Waterpik models are equally great and perform the same as the Philips Sonicare Airfloss. The Airfloss is bigger than the size you expect it to be and the reservoir size needs to be a bit bigger. There is a need to fill it after every two sessions. Batteries are not removable, the manufacturer is allowed to open and change the batteries. In most cases, you’ll need to buy a new device and can be costly if the batteries die faster. The Philips Sonicare Airfloss comes with 1 handle, nozzle and charger base and it costs $49.99 on Amazon and it comes with a 2-year limited warranty. If you are not satisfied with the product and the results it gives you, you are entitled to a no questions asked refund. 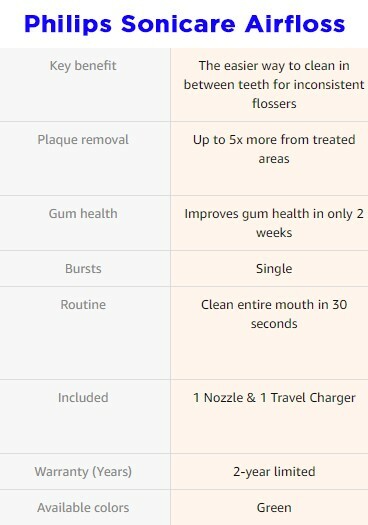 Philips Sonicare Airfloss has a total rating of 3.3 stars out of 5 on Amazon and 550 reviews and here are some of them. 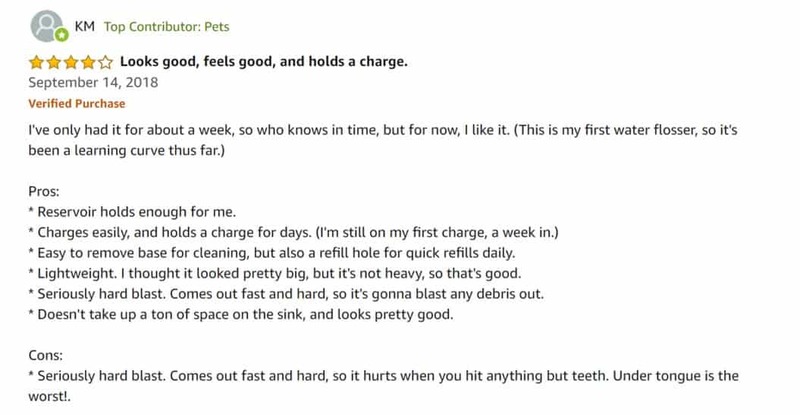 Check out the negative review I found on Amazon for Philips Sonicare Airfloss below. Where Can I Buy Philips Sonicare Airfloss? You can purchase this product on Amazon as you are guaranteed that you are buying a legit and safe product and it comes with a 2-year limited warranty. 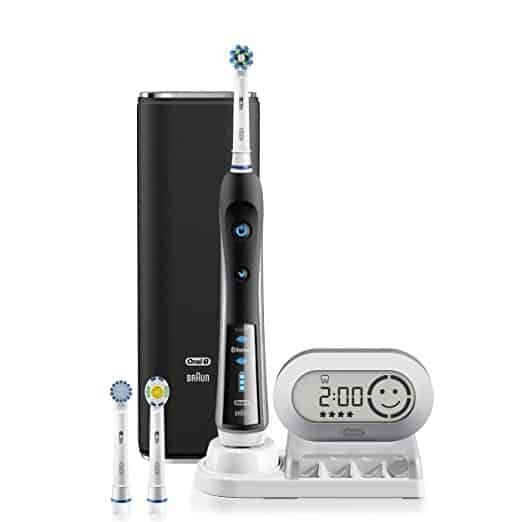 Come and check out the customer reviews of Philips Sonicare Airfloss in Amazon ($49.99). Q: Is it safe to use for those who have teeth and gums sensitivity issues? Is the water/mouthwash flow powerful enough that it can cause pain to someone using it? A: Philips Sonicare Airfloss is powerful enough to remove the food particles in between the teeth and hard to reach places inside the mouth. Even those who have some deep pockets between teeth will be able to use it and it will not cause any pain. Most of the dentists believe that using this device consistently for a long time will help strengthen your teeth and gums. You will feel fresh and clean after each use. Q: Is it safe to use for a person with braces? A: Yes, it is safe to use and it will work well as it effectively shoots air in between the teeth and especially if you have braces, there are tight and hard to reach areas that can be quite difficult to clean. Q: Is Philips Sonicare Airfloss waterproof and safe to use inside the shower? A: It is not recommended to use inside the shower as it is only water resistant and not waterproof. Q: Can you use any kind of mouthwash with the device? A: Mouthwash with no sugars and alcohol is recommended when using Philips Sonicare Airfloss. Q: Is the device the same as the waterpik? I am not sure which one is better. A: The waterpik uses more water than the Airfloss. It is easy and convenient to use because there is no cord attached with it that hinders your movement. As we all know flossing can be quite tedious and most of us just shrug it off and do not pay attention to it. There are times when we floss our teeth before visiting our dentists, sneaky? Aren’t we all guilty with doing it from to time to time? Philips Sonicare Airfloss is effective in cleaning the hard to reach surfaces of the mouth, even the in-between areas of the teeth. You do not have to endure the hassle of flossing your teeth manually, this is the answer for those who hate the idea of flossing. With just 30 seconds you can clean and remove food particles and plaque in your teeth. My only concern is the product able to withstand long-term usage? Also, I wish the reservoir size is a lot bigger. 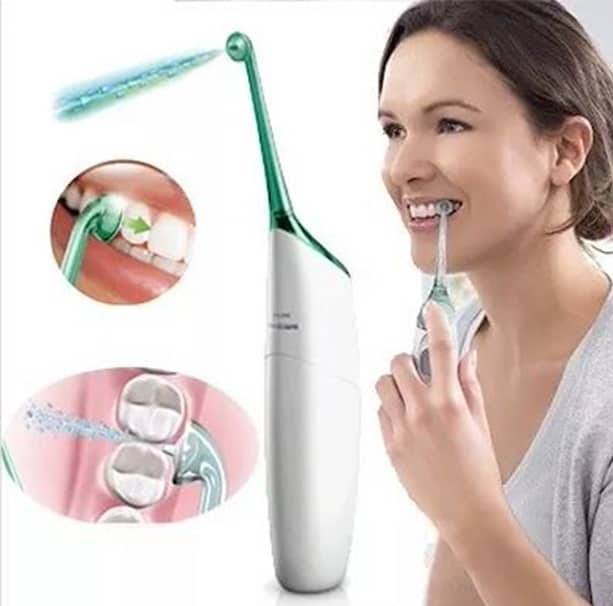 What also makes Philips Sonicare Airfloss a great product is that it comes with a 2-year limited warranty and you can request a refund if you are not satisfied with the results after using the product. For healthy gums and teeth, you can use Philips Sonicare Airfloss after brushing your teeth. It will not take too much of your time and it is easy to use. Use Airfloss regularly and say goodbye to cavities, plaque, food particles, and tartar! A lot of individuals are on the lookout in the market for an all-in-one oral care product that works well in cleaning the mouth as well as the gums and teeth. OraMD toothpaste is an all-in-one, all-natural toothpaste, a mouthwash, and a breath freshener. Having white teeth and fresh breath is a must for everyone. Personal hygiene is very important and must be given priority as it may also have an effect on your overall health. Cleaning and brushing your teeth 3x a day is usually required especially if you are using all-natural ingredients with antibacterial properties that make your mouth clean and free from bacteria. If you want to know if OraMD is an effective oral care product, continue to read on below as we will discuss and reveal to you the different ingredients that make it an effective mouth cleaner and breath freshener. This OraMD toothpaste review will reveal to you if this product is worth trying out or not. Hopefully, after you read this review, you will have an informed decision and you can then decide if OraMD toothpaste is the perfect oral care product that you have been waiting your whole life for. OraMD toothpaste is made from all natural products. It is not just your typical liquid toothpaste, it also works as a mouthwash and it also makes your breath fresh. OraMD toothpaste works well that it even target different types of bacteria which are 22 in total that are the usual suspects that cause oral health problems. OraMD comes in three products. OraMD Original strength, OraMD Extra strength, and OraMD Breath spray. OraMD Original Strength – It is the product that is advisable for individuals who cannot withstand strong minty taste. It works well to clean and freshens your breath. It is effective in giving relief to individuals who have gum sensitivity. OraMD Extra Strength – It comes with an extra punch. You are guaranteed with faster results by using this stronger formula and it is most aggressive in killing bacteria in your mouth. It is advisable for individuals who have more serious oral problems such as Periodontitis, Loose Teeth, and Advanced Gum Disease. 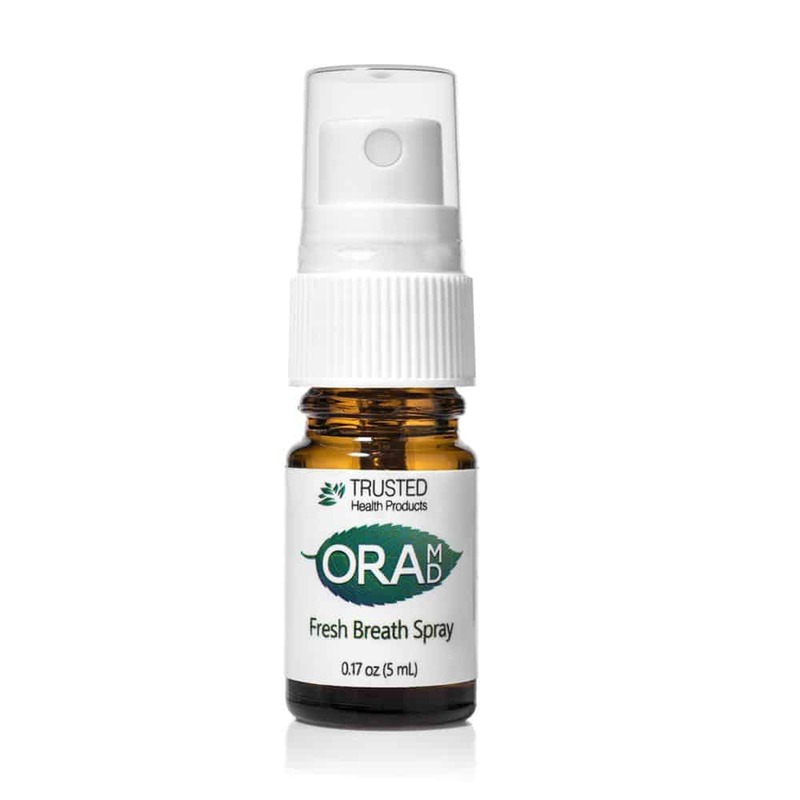 OraMD Breath Spray – It is made from the same formulation and ingredients of the OraMD Original Strength. It comes in a compactly sized bottle with a sprayer that makes it a must-have breath freshener on the go. It fits your pouch or pocket easily, perfect for those who love to travel. You can keep your mouth clean and fresh all day by spraying OraMD breath spray in between brushing. What are the ingredients of OraMD toothpaste? Is it safe to use? OraMD toothpaste is an all-in-one product that is carefully created by properly combining menthol, ketones, and other components to create this oral care product. OraMD toothpaste is created from all-natural ingredients that are 100% safe to use. It is meticulously created by combining almond, spearmint, and peppermint oils. These oils are carefully processed to produce 1000 different profiles. It is free from harmful chemicals like insecticides, herbicides, and fungicides. Almond oil – It is a good source of Vitamin E and unsaturated fats. It serves as a great base for the Spearmint and Peppermint oil. 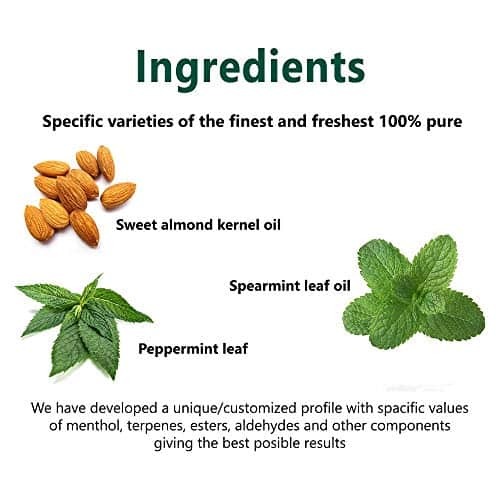 Spearmint oil – It is often used in toothpaste and mouthwash. According to the study done and published by Journal of Essential Oil Research, Spearmint oil has chemical components which are cis-carveol and carvone and both have been found out to have anti-microbial properties and were later found out to be effective against different bacterial strains and fungal pathogens. 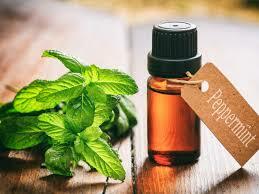 Peppermint oil – It is effective against mouth inflammation and toothache. It is a proven botanical oil that works great against bacteria in your mouth. 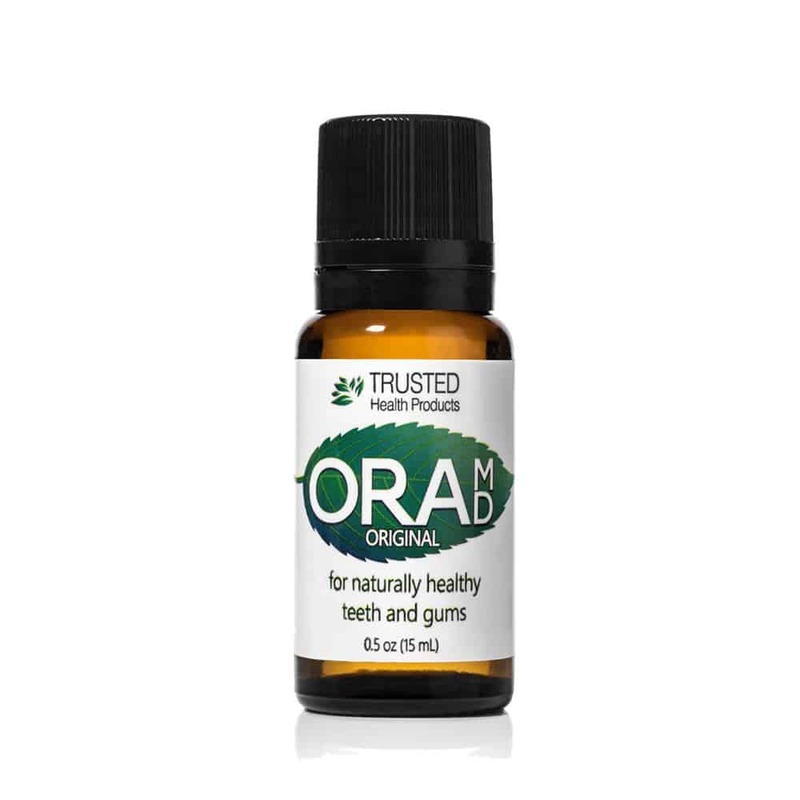 OraMD is oil-based making it easy to seep into your gums and fight off all the bacteria that can cause gum and teeth problems. It does not contain harmful chemicals that are found in commercial toothpaste that may be bad and affect your health in the long run. The natural ingredients used for OraMD are grown in the United States and are all manufactured using an eco-friendly manner. These spearmint and peppermint oils are created by using proper timing and farming precision while growing, pressing, and curing the all-natural ingredients. The farmers are taking care of plants by expelling the oils from the leaves and seeds. Once the oils are received, the peppermint oil will sit in a container for three months before it is used. It is naturally aged so the oils will settle and making it more powerful and effective with its antibacterial properties. Once the oils are ready to use, the mixing procedures are properly done by following the company’s standard operating procedures. Each bottle of the product is carefully processed and packaged by hand so you are guaranteed that the quality of each order is top-notch and safe from possible spills. OraMD toothpaste is created from essential oils. These essential oils are proven to fight bacteria that cause periodontal disease, plaque build-up, and bad breath which results in a clean, fresh, and healthy mouth. 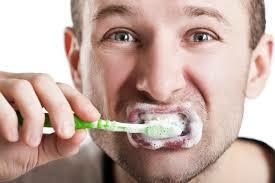 OraMD can clean between teeth and gums that may be hard to reach when brushing and flossing the teeth. It serves as an all-natural mouthwash and breath freshener. OraMD is easy and safe to use, for anyone who is 3 years old and above. The combination of oils is safe for use for anyone who has braces, fillings, veneers, bonds, dentures, and crowns. According to a research study done, OraMD ingredients are effective against Gram-positive and Gram-negative bacteria that are found in the mouth. The study shows that OraMD is effective in reducing periodontal inflammation that is caused by the antibacterial properties of the oils used in making OraMD. It is convenient. The bottle can fit your pocket or small purse. You can easily carry it wherever you go. If you need to make your breath fresh and clean, a couple drops will do. It is an all-in-one oral care product that makes it a must-have for anyone. There is no need for you to buy a mouth wash or a breath spray. No need to buy breath mints or chewing gum so you can have an on-the-go breath freshener inside your pocket or bag. It is an all in one solution that makes your life easier and better. There are no side effects even after using the product for a long time because OraMD is created by using all-natural ingredients and it does not contain any harsh or harmful chemicals. It has a strong taste. It can be a bit overwhelming to some when they try it for the first time. For individuals who need to use the Extra strength formula, it has a stronger minty taste. OraMD original strength may be less potent so it is required for those who cannot stand a strong minty taste. It does not offer whitening benefits. OraMD does not whiten teeth, so if teeth whitening are important for you, you must check out other teeth whitening products. You can also consult your dentist about it. The bottle is a bit small. You may need more since you need to use 2-3 drops of OraMD every time you use it. You will use it for brushing, make your mouth fresh like mouthwash and it serves as a breath spray as well. You may need to buy more as you use it continuously in a day. How to use OraMD toothpaste? OraMD is an all in one, all-natural product that contains antibacterial properties that eliminate bacteria in your mouth. OraMD is a liquid toothpaste, mouthwash, and breath freshener. One bottle of OraMD may last up to 4 weeks by using 2 drops of it every time you brush your teeth. 1. Brush two times a day, in the morning and evening. You can use 2 drops of OraMD on a toothbrush and you can brush your teeth normally. 2. After brushing your teeth in the evening, floss your teeth. Make sure to remove all food particles that are caught in between the teeth. 3. Use OraMD as a mouthwash to freshen your breath, during morning and evening. Use at least 2 drops of OraMD in an ounce of water. This will help kill and remove the bacteria in the mouth especially the back of the tongue. 4. During mid-morning and mid-afternoon, you can use at least 2 drops of OraMD on the tip of the tongue so you can protect the gums and teeth to remove and eliminate the bacteria and freshen the breath. I personally prefer buying the OraMD Original Strength which costs $22.97. For those who want a stronger minty taste, they can buy the OraMD Extra Strength which costs $39.97 and if you prefer to use a breath spray, OraMD Fresh Breath Spray which costs $8.95. For those who love the stronger minty taste, I suggest you purchase here so you can get 1 extra bottle free when you purchase 1 bottle of OraMD Extra Strength. It only costs $39.97 instead of $79.94. OraMD has a rating of 4.4 out 5 Stars on Amazon. What does OraMD toothpaste do? OraMD works. A lot of clients have reviewed this product. There is one who was suffering from receding gums and with the fear of losing his teeth he tried to use OraMD toothpaste. After he used the product, the dentist found out that his gums and teeth have improved. It works well against the bacteria that cause periodontal disease. According to some dentists, when they used the product gum problems have been relieved and cleared up. 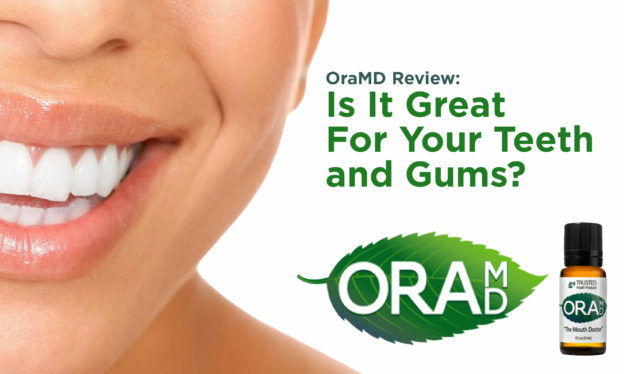 When they tried OraMD, it worked almost immediately and helped with bad breath. 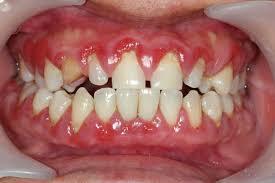 One client who has an allergy with toothpaste was able to safely use OraMD and their gum problems have all cleared up. For every product in the market there will always be negative reviews, see below an example of a negative review of OraMD toothpaste. How and where can I buy OraMD toothpaste? You can buy OraMD toothpaste on their website. Buying on OraMD website comes with an offer that you have a no questions asked one-year money-back guarantee if you are not satisfied with the product once you have started using it. Also if you like their product so much or if you want to gift OraMD to your family and friends, you can buy their offer the 7-bottle OraMD that only costs $99 instead of $160.79, you will have a discount of $61.79. OraMD is also available on Amazon and other websites online but I prefer ordering it on their website so there is a guarantee that you are buying a legit product and not fake ones that are common in the market. For those who are having second thoughts about this product, you can request a free sample package today. Check out oramd.com/free or you can also call or email Melissa at 888-423-7500, or at melissa@trustedhealthproducts.com. Q: How long will OraMD toothpaste last? Q: Is OraMD effective for different oral problems such as bleeding gums, plaque, periodontal disease, halitosis or bad breath, and gingivitis? Q: Is OraMD a teeth whitener product? A: OraMD toothpaste does not contain any whitening ingredients. 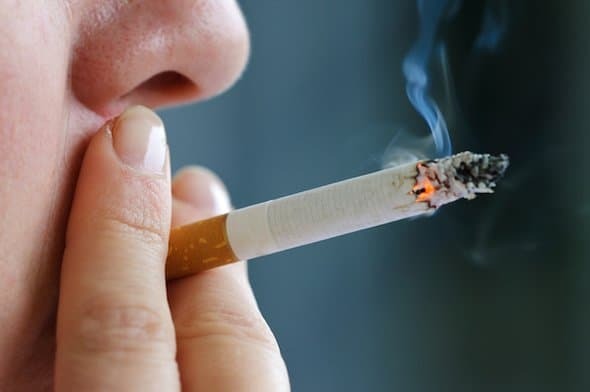 It will not remove any teeth stains that are caused by teeth staining products such as coffee, soda, food, and smoking. You can use all-natural ingredients such as baking soda to whiten your teeth before using OraMD in the morning. It has been proven that by using a small amount of baking soda helps whiten teeth after using it for a while. Q: Is OraMD made from all-natural ingredients? A: Yes, OraMD is made from pure, all-natural essential oils from peppermint, almond, and spearmint. 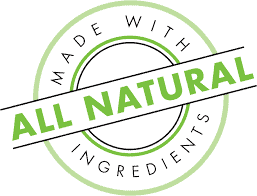 There are no harmful chemicals or additives in the product. 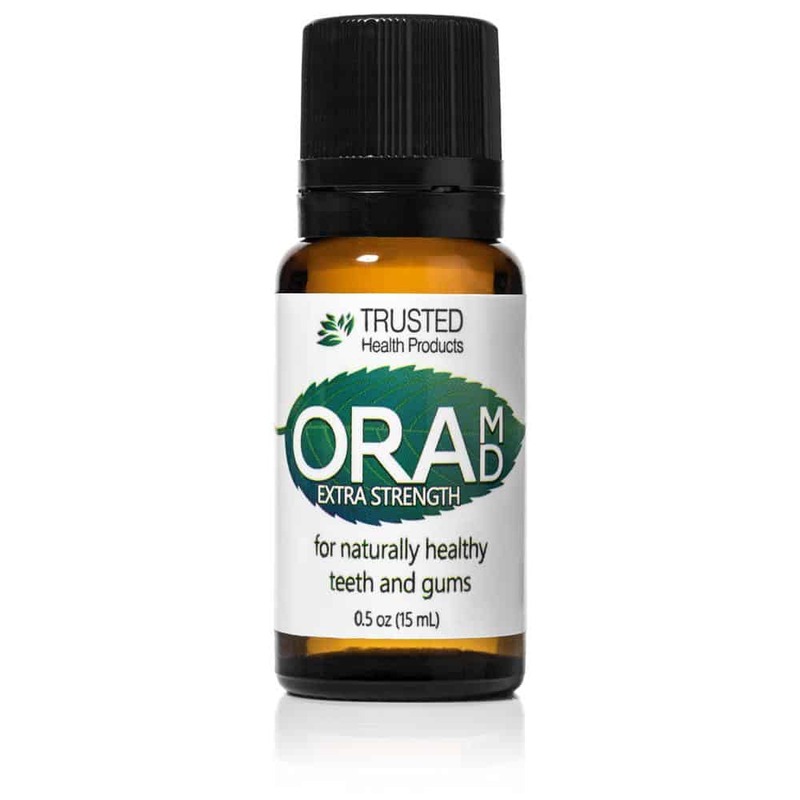 OraMD is formulated and designed to remove any bacteria and it helps relieve gum problems, bleeding, halitosis or bad breath, periodontal disease, and gingivitis. OraMD toothpaste is definitely one of the best and a must have oral care product. It is safe to use and works 100%. Anyone can try it out since it has an affordable price; their website is offering a One-Year Money-Back Guarantee. OraMD toothpaste is highly recommended by dentists worldwide. It is made from all-natural ingredients and it does not contain any harsh chemicals. It is an oral health solution that works to remove and eliminate the bacteria in the mouth. It is safe to use and has no major side effects since it is made from all-natural ingredients. OraMD toothpaste works as an all-in-one oral care product that serves as toothpaste, mouth wash, and breath freshener. This toothpaste is effective in fighting 22 types of bacteria that can cause periodontal and gum diseases. OraMD toothpaste is easy to use and it is not advisable as a teeth whitener product. It is a legit product, made in the USA by Trusted Health Products, a company that has an A+ rating as awarded by BBB. It works well as a toothpaste, mouthwash, and breath freshener. There are different brands that are claiming they are the best oral care product but in our opinion, OraMD toothpaste will not just clean and make your mouth fresh but it will also fight the different bacteria that may cause tooth decay and gum disease! 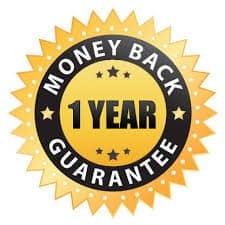 Try it now and you are guaranteed with a One-Year Money Back Guarantee offer when you order from the official website. If you have any questions and comments about OraMD toothpaste, please let us feel free to get in touch with us by commenting below. We will try our best to answer your questions to the best of our abilities.